A worldwide first. 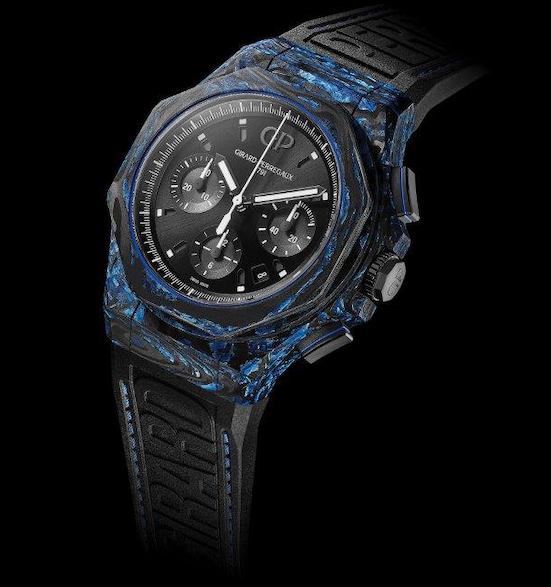 True to its tradition of innovation combining aesthetics and functionality, Girard-Perregaux introduces a Carbon of exceptionally regular and homogeneous finish. 100 times stiffer than steel, the material’s unique properties also make it airtight without a container. Integrating pigmented glass fibres, here in blue, the material is vibrantly alive, seeming in motion. With the “Earth to Sky” theme, Girard-Perregaux looks to infinity, the interplay of light and shadow, and the mysteries in-between. In this new approach, the brand opens a dialogue between the earth and the sky, between matter and space. And shows the science of timepiece finishing that is its hallmark from a new vantage point. Vibrant, sophisticated and with a distinctive hue, CARBON GLASS is a new type of carbon that is also uniquely impermeable, resistant and lightweight. The product of extensive research, CARBON GLASS was born of the determination to create a material at the cutting edge of innovation. Demonstrating extreme stiffness, presented here with touches of blue, and anchored in this year’s “Earth to Sky” theme, this aesthetic and technical achievement is a tribute to excellence. The material’s patented manufacturing process hinges on extreme compression at high-temperature injection. The result is a block of matter in simplified form to optimise homogeneity (regular partitions). The singular texture with a visual vibrancy is achieved by integrating the glass fibres associated to the carbon. The net effect: each finish is unique, and thus each timepiece has a character all its own. The major innovation with this technique resides in the perfect seal achieved through the material’s impermeability: no other carbon manufacturing technique matches this level of airtightness without a container. Here, the compression of the material – which has an extremely regular and homogenous structure – leads to a high density which in turn ensures a perfect seal. From an aesthetic perspective, the result is, contrary to other carbon applications, a smooth and uniform surface on all sides. Here, the colour is defined by using blue glass fibre, but other hues are possible as well, and even other substances such as gold may be substituted. The other innovation is the tremendous stiffness, here, too, in all three dimensions – which other types of carbon don’t reach. CARBON GLASS is stiffer than steel by a factor of 100. Moreover, it serves purposes that reach beyond pure packaging aesthetics: with a density close to 1, it practically floats in water (the density of steel is approximately 8 and that of titanium 4.5). On the occasion of the SIHH 2019, this new material is being unveiled – as an exclusive preview – in the form of the new Laureato Absolute Chronograph. Girard-Perregaux is a Swiss high-end watch manufacturer tracing its origins back to 1791. The history of the brand is marked by legendary watches that combine sharp design with innovative technology. Aesthete of the invisible, in 2019 the Maison is exploring the Cosmos, the essence of time, by introducing a new universe of innovative materials and unexpected complications within the fundamental collections, united by a single theme: “Earth to Sky”.